It's been a while since there was a quiz at Food Blogga. Are you ready? I'm warning you, if you thought the GRE was hard, wait until you get a look at some of these questions. 1. Which of the following is true about the name "kiwi"? A. It is the presumed name of Gwenyth Paltrow's next baby, whose daughter is named Apple. B. It is the name of a new ipod that stores recipes. C. It is both the name of a flightless bird and the national symbol in New Zealand and replaced the fruit's original name, "the Chinese Gooseberry." A. It's an edible fruit that grows on a vine. B. It's rich in vitamin C, fiber, antioxidants, and even omega-3 fatty acids. C. It's on the list of endangered species. A. You'll start referring to all of your friends as "mate" and talk with a New Zealand accent. C. Your stomach will begin to sprout unsightly fuzzy hair. Then you'll have to visit Jeff's derm blog to find out how to remove it. Just when I thought fava beans had a lot of names, along comes the kiwifruit (kiwi) originally known as the Chinese Gooseberry. It's also known as the Macaque peach, the vine pear, the sunny peach, the hairy bush fruit, and my personal favorite, "strange fruit." Call it what you will. Just make sure you eat these edible berries. The kiwifruit is the edible berry of the cultivar group of the woody vine Actinidia deliciosa and hybrids between this and other species in the genus Actinidia, which is native to Shaanxi, China. But who doesn't already know that? Kiwis are grown in mild climates all over the world. Surprisingly, New Zealand is not the leading world producer of their famed fruit. The land of pasta, balsamic vinegar, and buffalo mozzarella is --Italy. Though I wouldn't recommend eating kiwi with any of the aforementioned foods. Kiwis are both delicious and nutritious. With a flavor that tastes like a mix of citrus, grapes, strawberries, and bananas, a kiwi is both sweet and tart. Though the hairy outer skin is edible, I'd advise against eating it. That is, unless you really need the fiber -- a kiwi's fiber is tripled with the skin on. If you do eat it, then have a new container of dental floss at the ready. You'll need it. Kiwis are highly nutritious: 2 kiwis are just over 100 calories and provide over 280% of your daily vitamin C needs! They're also a good source of cancer-fighting antioxidants, vitamin A, fiber, and omega-3 fatty acids. Kiwis are ideal in fruit salads, but they're also wonderful in savory salads, salsas, and smoothies. If you've never baked with fresh kiwifruit, then get ready to be pleasantly surprised with these Kiwi and Coconut Muffins. Made with light coconut milk, orange blossom honey, and orange zest, they're remarkably moist and enticingly aromatic. Each bite is punctuated with juicy fresh kiwi and crunchy coconut topping. After finishing one, you may just find yourself saying, "Hey, mate, how 'bout another?" Made with light coconut milk, orange blossom honey, and orange zest, these muffins are remarkably moist and enticingly aromatic. Plus, each bite is punctuated with juicy fresh kiwi and crunchy coconut topping. Peel kiwis. Dice and set aside. In a large bowl, combine flour, sugar, baking powder, baking soda, and salt. In a separate bowl, whisk together coconut milk, melted butter, and eggs. Add the orange zest, honey, and vanilla extract, and whisk until just combined. Add to the flour mixture, and stir quickly until well combined. 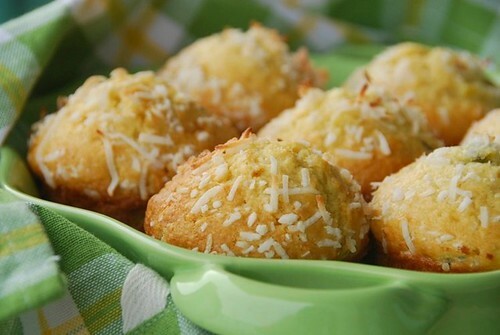 Fold in the kiwis and toasted coconut. Spoon the batter evenly into the 12 molds. 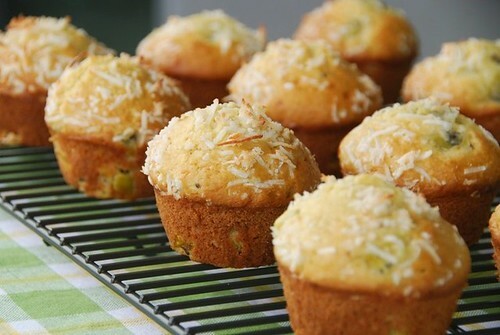 Sprinkle the tops of the muffins with 3 tablespoons shredded coconut. ** Use kiwis that are ripe yet still somewhat firm. If they're squishy, then they'll be too watery in the muffins. Also avoid adding more than 3/4 cup as it could make the batter too wet. That little fleck of verdant kiwi in the cut muffin just made my day (and my mouth water). This is one of the most innovative muffin combinations I've seen in awhile and I'm really impressed! I might be tempted to add just a tad of green food coloring to half the batch which, if too ugly for others to eat, I'll gobble up myself :P Thanks for this! That was a brilliant post Susan.Very informative one. I did get 2 correct ans in dat.(yippee). Lovely looking tempting muffins. I will try this for sure. What a creative way to use kiwis. I don't think I've ver seen them baked in anything! Love the use of kiwis in a muffin. i normally buy the yellow ones as they taste sweeter - I can imagine using a mix here! Looks like a winning combination to me, kiwi and coconut. They love them both here, so a good thing to try out soon! What a wonderful flavor combination! Both fruits are available here...I'll be bookmarking this! You are such a good teacher Susan! Very instructive :D. It amazes me to know that the peel is edible but I trust you! The muffins look spectacular and different from the ones I'm used to. The big bites of kiwi look beautiful in the muffins! It would be nice to have something so tropical feeling with all the snow we have outside. What a coincidence! We just bought some kiwis. I never would have thought to put them in muffins. They look scrumptious. What a fun post. And so interesting and informative as well. I've never tried kiwi in muffins, great idea! They look fabulous! Very interesting Susan. We grow a hardy type of kiwi here in the Okanagan that has tinier fruit the size of a cherry. Dipped in chocolate it is amazing!!!! those look so tasty! i'll bet the kiwi and coconut go so well together! And did you know that France is a major producer of kiwifruit? I miss that..... We'd normally pick the fruit in January and have them the rest of the winter. Wow - I did horribly at the quiz!! But yum - this flavor combinations in these muffins look so tasty! I've never baked with kiwis before! **Any clue where us east-coasties might find orange blossom honey? Very unusual combination, I bet they taste fantastic. Those muffins looks heavenly! Kiwi and coconut is such a great combination. I love them both. Definitely bookmarking these for when I can walk again! my favorite thing about kiwi is the crunch of the little seeds. incorporating that into a muffin is brilliant--bravo! These sound so refreshing and I love the combination of flavors. My daughter will love these - I'll send her to your blog! Actually, I'll have you know I have a kiwi vine in my garden! There are different varieties of kiwi and this one actually produces fruit that are smaller and rounder and yellow. And wow! I love kiwi. I love muffins. I bet I'll love muffins with kiwies!!! A must try to me! I have never thought to put kiwi in muffins! I love kiwi, so I will definitely be experimenting. Mmm. Italy, you say? Susan, I always learn something new when I drop by!! Would be even happier with one of those in my hand - sounds and looks perfectly combined flavour muffins. Nice muffins and fun quiz! Thanks! We can smell the kiwi and orange now! How can you ONLY eat 12 of these? Oh my! I never knew Kiwis were even grown at all in Italy! Live and learn :) And very well done baking them into muffins-- I always thought they were too soft and juicy (like strawberries) and any dessert application with them had to have them fresh. These look wonderful, though! I have never heard of a kiwi muffin can't wait to try Thanks for sharing. I thought I did great and then I find out the answer is Italy? Who knew! What a nice looking, delicious muffins. Great quiz. Veeeery creative muffins, Susan. My hat's off to you. The only question I missed was Italy. Who knew? Those muffins look surprisingly good! I am curious about italy producing so many kiwi fruits - do they eat them a lot or just export them - I just can't think of traditional italian food with kiwi fruits! And regarding eating the skin, I was once told by a New Zealander I worked with that she used to eat them with the skin before finding out all the pesticides the skin contained - which put me off the skin too! Just looking at these makes me crave summer. The combination here sounds so good! Susan, I love kiwis (that's how we call them here, too) and eat them regularly, but have never cooked nor baked with them. Those muffins look great! 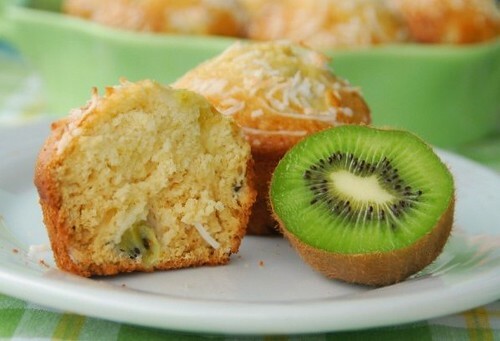 I never would have thought of putting kiwi in muffins, but yours look and sound delicious! Thanks for the inspiration- it sounds like a bit of tropical sunshine in the midst the chill of winter! Loved the quiz and the history behind the fruit. fun post and the muffins look great! anything with coconuts, i'm game! !didn't kiwi's were this nutritional eventhough we buy it pretty much every week...my mom is huge fan!thanks for the recipe...looks delicious. Brillian post Susan and brilliant idea to put all those lovely flavours of kiwi into the muffins. I don't believe that someone would eat the skin as well. So much vitamin C in a kiwi, I never knew! Thanks for the scoop. These muffins look tasty and sound very tropical. Beautiful muffins and very interesting post :) I learned some new things about kiwis. I love kiwis, but very rarely do I bake with them. I usually eat them up too quickly! : ) These muffins look really good though. I'm going to save the recipe. What an interesting flavor combination! I've never seen a recipe with baked kiwi, although we love the plain old raw fruit here in this house of boys. Thanks for the great idea...we will definitely be trying these. Ah, tripped me up with Italy...who knew? I like to eat the skin if the fruit is sliced in thin slices. The muffins sound really yummy and look pretty, too. we'll look forward a good crop of Kiwifruits this year, then I can make these! Who knew a kiwi was a berry?? Of course, I didn't really know what it was! And, Italy? I'm now dreaming of a kiwi pasta. Wouldn't that be eye-catching? I didn't know you could bake with kiwis! They're so pretty one keeps seeing them decorating desserts a lot. What beautiful little muffins! Great flavor combination! Hairy bush fruit - that's absolutly priceless!! I mostly have kiwis in yoghurt for breakfast, but I *love* the flavour combination in these muffins! I absolutely love how pretty kiwis are, I just want to take their picture! I've never baked with them although I recently made a delicious kiwi ice cream that I'm in love with. Oh wow delicious! You've combined two of my favourite things - kiwis and coconut! I love that you used coconut milk too. These were fantastic! Thanks for sharing a great recipe! I made those and love them! Didn't now baked kiwi tastes that good! may-Oh, wonderful! I'll be right over to check them out. I just tried this recipe but didnt feel like using +2 egg whites so I jsut used 2 eggs overall and they came out really yummy. I was impressed with how moist and soft the muffins were. The only sad part is that it really didnt scream 'kiwi coconut muffin' but rather 'coconut orange muffin'. Still, it made a very pleasant breakfast. Thanks!